It’s time for another Cute Outfit Ideas of the Week! This edition is dedicated to the pink leather jacket. A jacket that is fun and more versatile than one might think. 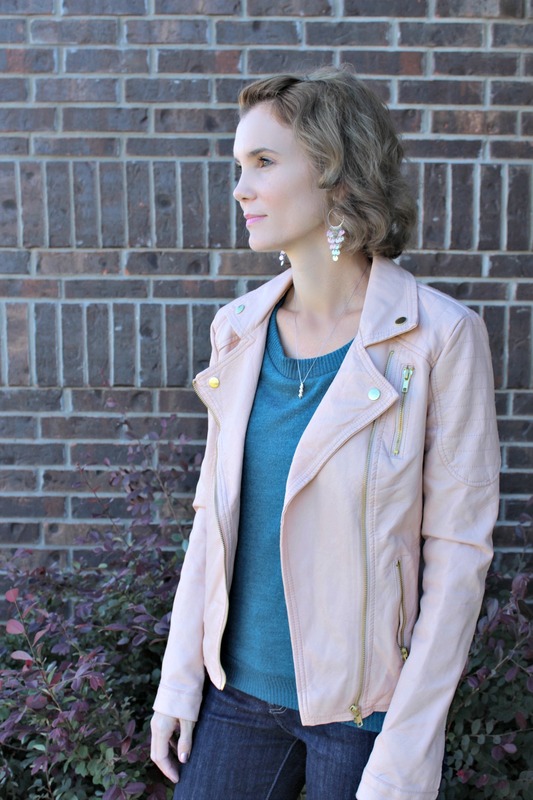 This weekend it was a little bit cooler and I was able to pull out my pink faux leather jacket that I scored for $5 at Plato’s Closet. It was originally $10, and I had a $5 off coupon. Not bad! I love Plato’s closet and usually walk out with something. My daughter and I also hit up The Domain in Austin on Saturday, and H&M was having a huge sale on dresses, skirts and shirts. I walked away with the cutest dress for only $7. Although it’s a summer dress, I knew I could make it work for fall. By adding a jacket and my favorite fall booties, I have an outfit I love. I’m still experimenting with outfits and my new hair color. There are things I felt looked good on me before, that I’m not quite sure about now. But I’m still loving the color change! As I was experimenting in my closet (a favorite hobby of mine), I was trying on other items with the pink jacket. I decided to add a complimenting pop of color and I love it. What else goes with a pink leather jacket? Here are more cute outfit ideas for you. What can take a simple statement shirt and black jeans to the next level? A pink leather jacket. I love this look and will definitely be recreating it. 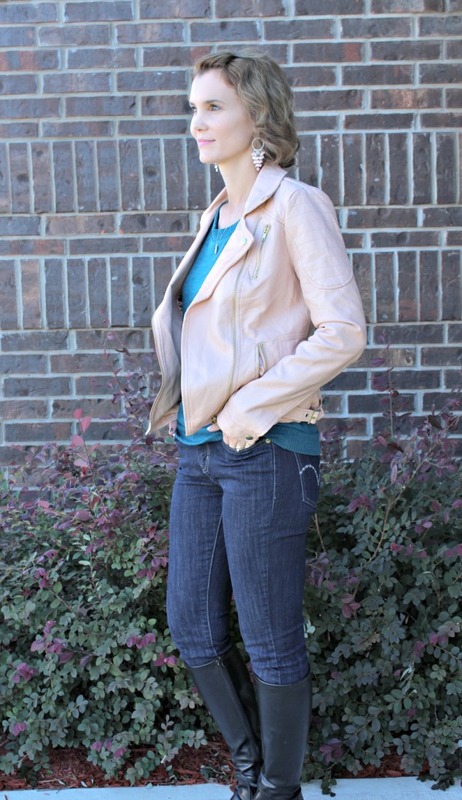 A pink leather jacket paired with a white shirt looks very classic. Dress it down with jeans and brown booties. You can also add a little sparkle and glam with gold jewelry. This is from the Ralph Lauren spring runway. 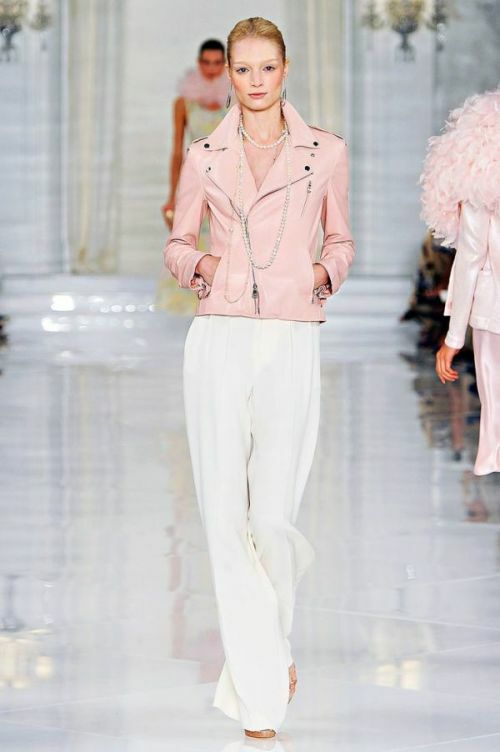 The pink leather jacket gives the white pants some edge, while the pearls makes it classy. Pair a pink leather jacket with patterned shorts or pants for a fun look. 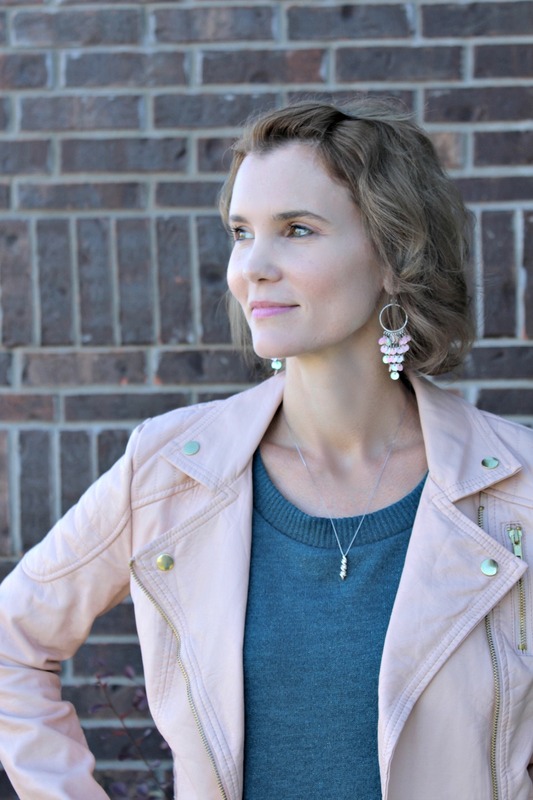 Do you own a pink leather jacket? Do you want one now? I hope these cute outfit ideas featuring one of my new favorite pieces gave you some outfit inspiration. For more ideas, see the rest of the Cute Outfit Ideas of the Week series.